* Result may vary depending on each patient anatomy. 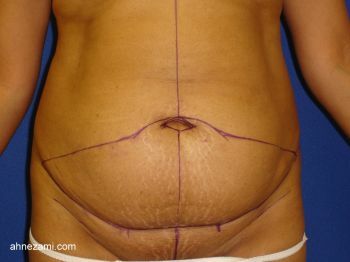 Case # 12086 / Age 43 / Weight 155 lbs / Height 5’9” / 2 Children / This 43 years old mother of two children came to Jacksonville Cosmetic Surgery Center for her tummy tuck surgery since she has developed excess skin and bulging on her pubic area and her abdomen due to those pregnancies. Her abdominoplasty surgery went flawlessly and her abdomen looked great and the scar is fading. Patient is very pleased with the result of her tummy tuck surgery; she stated that now she can wear her daughter’s jeans.